On June 21, 1576 (June 18 by other calculations), the two armies met at Haldighati, near the town of Gogunda in present-day Rajasthan. While accounts vary as to the exact strength of the two armies, all sources concur that the Mughal forces greatly outnumbered Pratap’s men (1:4). The battle of Haldighati, a historic event in the annals of Rajputana, lasted only four hours. In this short period, Pratap’s men essayed many brave exploits on the field. Folklore has it that Pratap personally attacked Man Singh: his horse Chetak placed its front feet on the trunk of Man Singh’s elephant and Pratap threw his lance; Man Singh ducked, and the mahout was killed. 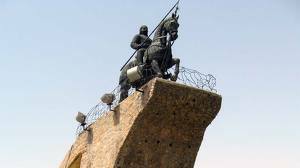 However, the numerical superiority of the Mughal army and their artillery began to tell. Seeing that the battle was lost, Pratap’s generals prevailed upon him to flee the field ( so as to be able to fight another day. 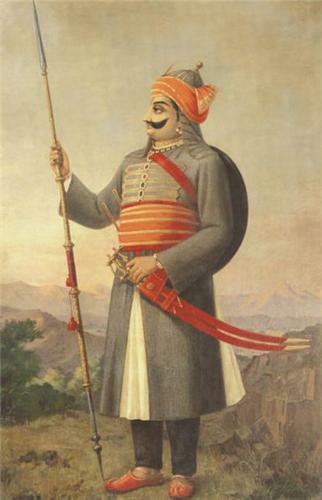 Myths indicate that to facilitate Pratap’s escape, one of his lieutenants, a member of the Jhala clan, donned Pratap’s distinctive garments and took his place in the battlefield. He was soon killed. Meanwhile, riding his trusty steed Chetak, Pratap made good his escape to the hills. But Chetak was critically wounded on his left thigh by a Mardana (Elephant Trunk Sword) while Pratap had attempted to nail down Man Singh. Chetak was bleeding heavily and he collapsed after jumping over a small brook few kilometres away from the battle field. When Pratap’s general donned Pratap’s clothing and armour, it went unnoticed, thanks to the chaos of the war, but for two Turk knights from the Mughal army. They could not communicate it with others in their group, due to the linguistic barrier (the appropriate language would have been Persian, Marwari or Arabi, given the composition of the Mughal army). They immediately followed Pratap without wasting time. The moment they started chasing him, Pratap’s younger brother Shaktisingh, who was fighting from the Mughal side, (he had some disputes with Pratap at the time of Pratap’s coronation; hence he had defected and gone over to Akbar’s court) realized that his own brother was under threat. Pratap’s general’s sacrifice had already been discovered by him. He could not help but react against a threat to his own brother. He followed the Turks, engaged them in single combat and killed them. In the meanwhile, Chetak collapsed and Pratap saw his brother Shaktisingh killing the two Mughal riders. Saddened by the loss of his beloved general and horse, he embraced his brother and broke into tears. Shaktisingh also cried and asked for his brother’s pardon, for having fought as his enemy. Pratap pardoned him (later on he was given a huge estate near Chittor). Shaktisingh then offered him his own horse and requested him to get to a safe place. This incident is famous in Rajasthani folklore, a song “O Neele Ghode re Aswar” (O Rider of the Blue Horse) mentions it. The impact of the battle on the Mughal army was also significant. In terms of numbers the Mughal army suffered heavier losses. This was also because of the intensive arrow showers by the Bhil tribes of the surrounding mountains who had sided with Pratap. To honour their contribution, a Bhil warrior was placed next to Pratap in the Royal Coat of Arms of Mewar. The battle of Haldighat is considered to be the first Major breakthrough of Rajputs against the Mughals since the Second Battle of Khanwa in 1527, which was fought between Rana Sanga grandfather of Maharana Pratap, and the Mughal Babur grandfather of Akbar. It is regarded with a degree of significance by many Rajput families.